Flights are booked and bags are packed for your trip abroad, but are you really as prepared as you think you are? 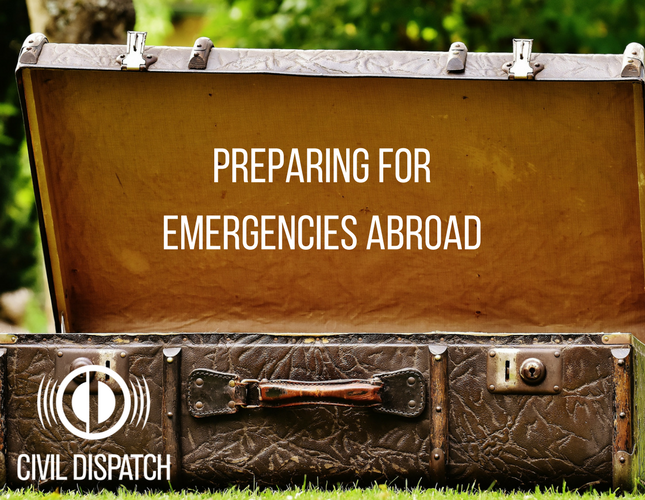 When traveling, whether it’s inside the country or overseas, we don’t think about the possibility of having to deal with an emergency, we are just simply on vacation. Double check all of your travel requirements before you leave. Research any documents you might need to take in case your passport is lost or stolen and you have to prove your identity. Have all your contact info and addresses of where will be staying memorized or in a safe place. Provide this information to your family as well just in case they lose contact with you while you are traveling. You can easily do this online by giving the state department your contact info and where you are planning on traveling. This can help them easily contact you in case of an emergency while you are traveling. Before you leave, provide at least two members of your family with your trip itinerary. Include copies of everyone’s passports, flight information, a trip itinerary, and any general information about the activities you will be doing while you are on your trip. Encourage your children to memorize general information about you and your trip. They should memorize things such as names, addresses of where you are staying, and phone numbers or the easiest way to get in touch with you if they were to get lost. The easiest way to do this might be giving them a business card or a notecard with this information it. Decide on a meet up point just in case of an emergency and you get separated from your children. Make it an easy to find check point, so they aren’t confused if things start to get chaotic. A lot of tourists walk around the cities they are traveling with a backpack. In the backpack are things like an extra set of clothes, a first aid kit, snacks and contact details for family members at home. If your child is old enough, it wouldn’t hurt to have them carry their own backpack. Once you arrive at your destination, take a couple of hours to point out things to your children such as the U.S. Embassy and the local and nearest hospital to where you’re staying. Running out of money while you are abroad can have much bigger consequences than it would if you were back in the states. Start your emergency fund by slowly stockpiling a certain amount every month or from every paycheck. You can open a separate savings account so that you aren’t tempted to dip into your fund. Say your belongings were to get burnt in a hotel fire, travel insurance would cover those belongings. Check to see if your health insurance has international coverage and if your credit card has some sort of travel coverage. Never carry all the cash you brought with you at once. Always carry half with you and leave half in your room just incase you were to get robbed or lose your money, you still have some leftover. Always place a travel alert on your bank account and credit cards because attempting an overseas transaction that a bank doesn’t know about can freeze your bank account.